Well this was our final confluence attempt for the day, having achieved three out of three thus far. After making our way to the Loddon Valley Highway via Wycheproof, Boort and Durham Ox, we headed north observing cattle farms on both sides of the highway, which was a welcome change from wheat and sheep. At 36º00.16’S 143º56.88’E, we turned right at Mincha-Canary Island Road with the GPS showing 4.69 km to go. A short distance past the intersection with Godwards Road (36º00.16’S 143º59.73’E) I got out of the car with about 350 metres to go. 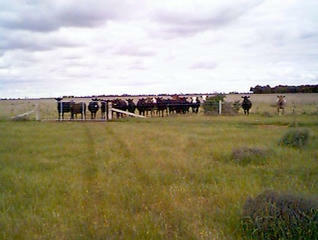 The confluence is on the other side of a fence to an empty paddock; however, that fence is electrified. There is a big willow tree nearby and I considered using one of its overhanging branches to get to the other side, but it all looked a bit too hard. We drove back to the intersection with Godwards Road and noticed an access gate to the paddock with the confluence adjacent to a cattle loading station. I wasn’t willing to start opening and closing farm gates without someone’s permission so I resigned myself to chalking this one up as an attempt only. As we were driving back to Mincha-Canary Island Road (I’d love to know how they came up with that name), I noticed a man working on his truck in a yard over the road from the paddock I wanted to be in. I approached him and explained what I was doing and after a brief chat about how a GPS works, he gave me permission to drive through his gate and get my photos. He also reminded me of the golden rule in the bush of leaving all gates the way you found them. So with the help of a friendly farmer I got to the confluence, much to the amusement of a group of cattle which had moved across to a nearby fence to have a closer look at what I was up to. So there ended an extremely successful confluence hunting day on which I was successful on four out of the four attempts. This leaves only two unvisited confluences in Victoria (plus the one on the military base at Puckapunyal) which are both in the Alps and will surely be much harder than the ones I did today.